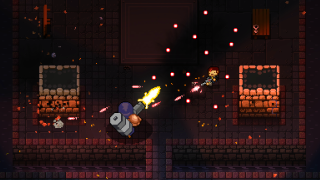 I got to play Enter the Gungeon at PAX East on Sunday, but given my first-timer skill level, it was more rewarding to watch Dodge Roll co-founder Brent Sodman deftly avoid bullets and demonstrate his accuracy with some of Gungeon's more unusual weapons. There are already 130 guns in the game, and Sodman says they hope to have "somewhere between 200 and 230" at release. My favorite was also his favorite: a gun that shoots bees. It might only be improved if it were a dog with bees in its mouth. I talk to Sodman in the video above, where he describes some other guns of note and tells that they're "targeting September" for release.